Today we’re sharing the highly requested ability to edit the Low Hard Drive Space threshold within an Asset RMM Policy (previously set to 15% and unable to be changed). Head to the “Policies” section in your Syncro account. Select an Asset RMM Policy that you’d like to adjust the Low Hard Drive Space threshold on (or create a new one). 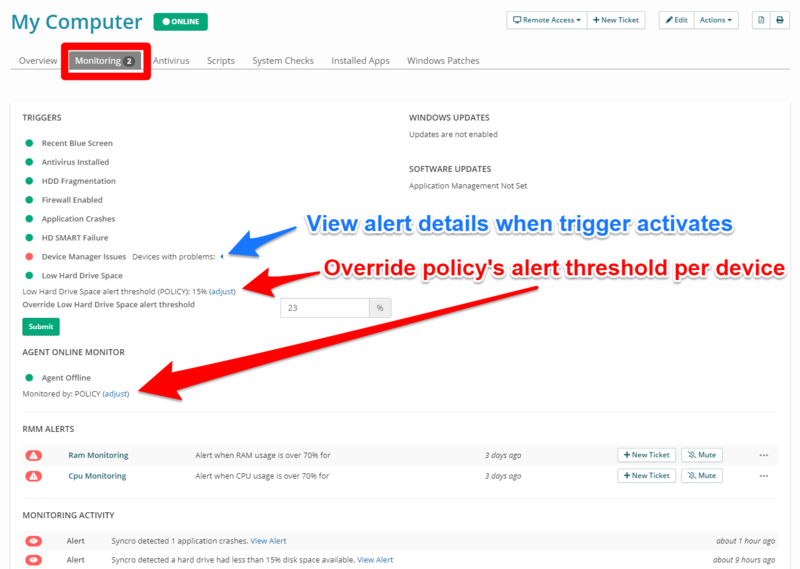 Locate the “Alerts” section on the Policy’s edit/creation page. Check-mark the Low Hard Drive Disk Space option and fill in the field with your chosen threshold amount. If you don’t place a number into the field, the default will remain at 15%. This threshold will be used for all Assets with the Policy applied, but you have the option to change this on a per-Asset basis if you wish. If you go to a particular Asset in your account and select the Monitoring tab, you’ll notice that we’ve added a setting similar to the offline alert override option. Under the “Low Hard Drive Space” listing, hit the “adjust” link and type in the percentage you’d like to use for this particular Asset. This allows you to override the Policy threshold setting for this Asset, but not for the entire Policy. We hope that this allows you to properly monitor Assets according to your own standards and needs. Learn more about Policies in our Help Center article here.